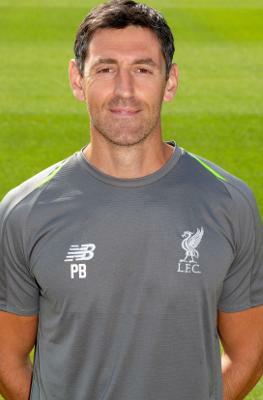 Phil Bolland is head physio for Liverpool U18s. He qualified with bsc hons physiotherapy in 1997 from Manchester university while playing semi-professional football, and he continued his career in the Royal Liverpool Universities hospital trust up to band 7 level. In 2001 he moved into the football league as a full-time professional footballer as a commanding centre-half with Oxford United. His full-time career spanned 14 years with spells at the likes of Chester City, Wrexham, Peterborough United, Cambridge and Barrow, and also worked in a private practice in his spare time. Having finished his football career, Phil became more involved his new role and he started working with Liverpool on a part time basis in 2012, and progressed to his current position as lead U18s physio.